(Click on image to enlarge) . . . but I could see across Grey Sand Hills in the middle of the picture to the channel and slightly to the left of the Firing Practice Area notice in the chartlet below. 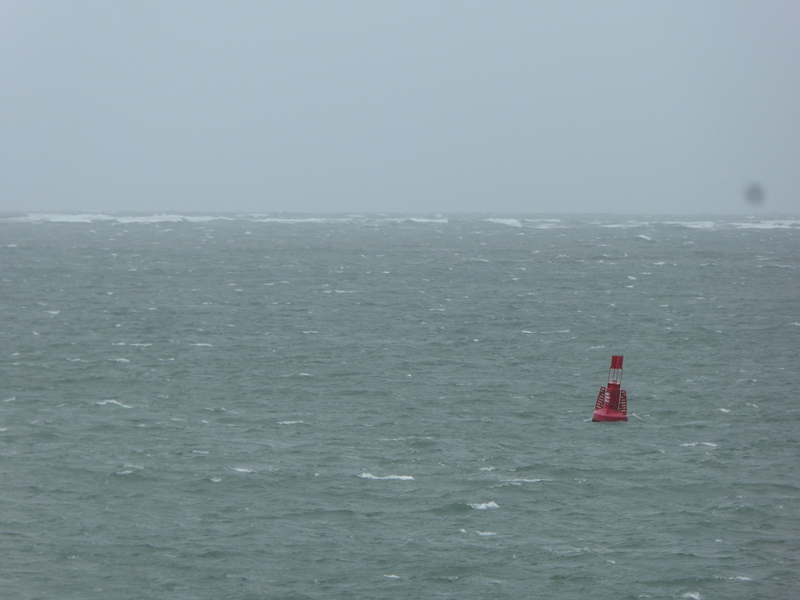 The weather made the buoys difficult to see. I picked out the Outer Pulley and the Pulley buoys: and the lifeboat . . . and also found a red port hand buoy not on the chartlet . . . All this is interesting pilotage and, on a calm day, relatively straightforward. The port hand buoy will help . Not today, of course. We won’t be attempting the Bar in this weather. But . . . suppose it’s 1859 and you are the skipper of a trading ketch arriving late at night without an engine, chased by a sudden North West gale – (today’s gale is nearer West South West). You have no depth sounder (a lead-line instead), no radio, no gps and no possibility of a local pilot getting out to you to guide you in. Whereas the modern Pilot has a short description of the Bar, the section on “Barnstaple Bar and Biddeford Harbours” (sic) in the 1859 “British Channel Pilot” * goes into it at some length – not surprisingly. Having described the approach to the entrance in detail, including: “. . . The water gradually shoals towards it from 7 and 8 fathoms, dark sand, at a mile off, where vessels may in settled weather anchor until tide-time . . .” (Dark sand would be noted on the lead-line), it describes the Bar thus: “. . . The shoal which constitutes the bar rises suddenly from 3 fathoms, as well as from a pool within of the same depth, to a depth of only 6 feet, and this is to the extent of a mile . . .” It then describes the channel. The “Biddeford, or Braunston Lights” (sic) are detailed, including: “. . . To enable ships to go over the bar with greater safety, and also to enter by night as well as by day, two beacons have been erected at the entrance to Biddeford, or Barnstaple. Captain Denham’s description of these lights is that “they consist of two fixed lights, near the high-water mark on the port hand going in, and their distance apart is 933 feet . . . ” Because the sands shift and the channel changes, the forward, lower of these lights could be moved to the left or right depending on the situation. The higher light had a range of 14 miles. The modern equivalent of those leading lights are now sited in Instow, further from the channel. I am not sure whether they are adjustable or not. 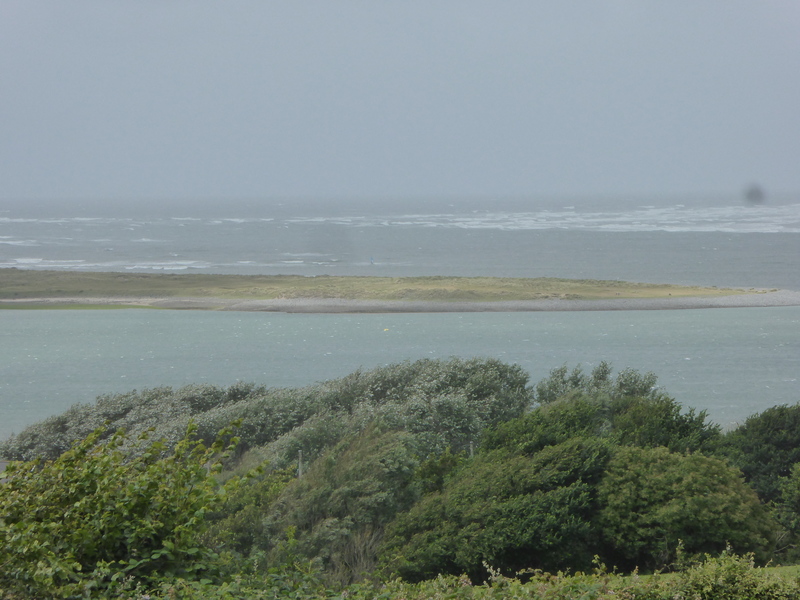 The directions for crossing the bar and keeping to the channel in heavy weather are explained, including the possibility of picking up a pilot. However, what happened in a night arrival during a very heavy weather? . 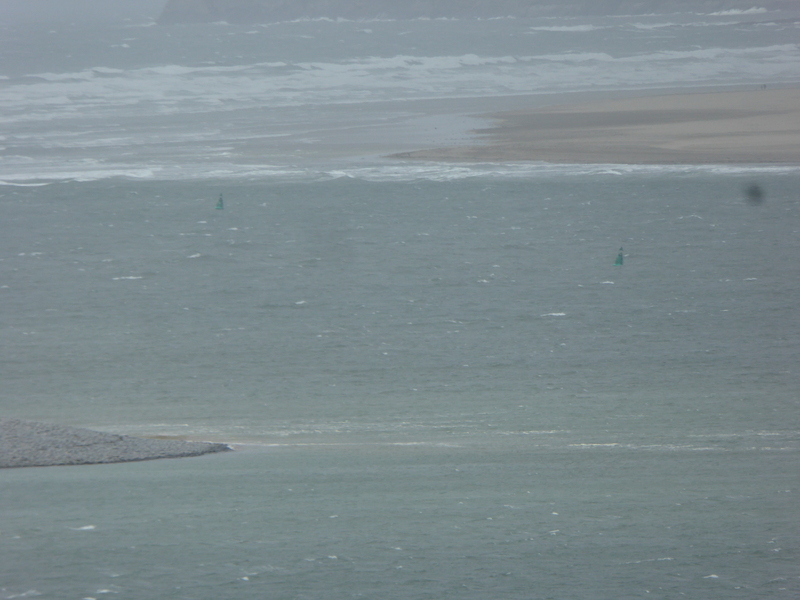 . .
Of course, you would have tried not to be in Barnstaple Bay in a Northwesterly gale. It was not always possible. The sheer numbers of vessels involved was impressive. 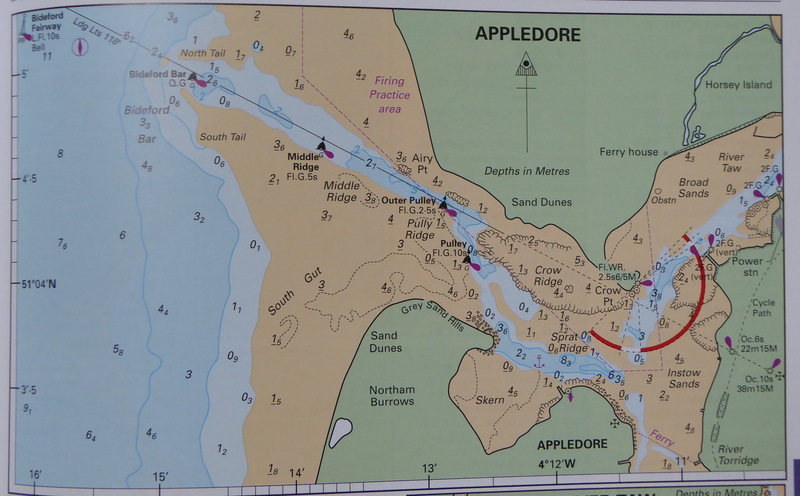 In “The New Maritime History of Devon”**, Duffy et al note an entry in the North Devon Journal in January 1866: “Appledore. Number of vessels that entered this creek for the ports of Bideford and Barnstaple during the year ended 31.12.1865, coastwise with cargo 2,276 vessels, tonnage 112,311; foreign 32 vessels, tonnage 7,552; windbound 68 vessels tonnage 4,091: Total 2,376 vessels, tonnage 124,254.” Brian Waters in his book “The Bristol Channel”*** notes that: “As recently as the 1920s as many as 63 vessels were counted crossing Bideford Bar on a single tide.” And don’t forget the 104 ketches mentioned in my first post on this visit to Appledore. In 1858, the year before this edition of the British Channel Pilot was published (and two years after the opening of the Richmond Dry Dock in Appledore), a Royal Commission was appointed to look into the ‘matters of harbours of refuge’. That September, they took evidence in Bideford that regarding shipping in the Bristol Channel. The subsequent report is very detailed containing verbatim records of the proceedings. The Commissioners appeared to be pressing for a harbour of refuge at Lundy Island. However, the evidence submitted by the local seamen was that Lundy, with its deep surrounding waters, was unfavourable in shifting winds and that Clovelly would be preferable. In the event, neither was chosen and no harbour of refuge was developed. In 1899, my great grandfather’s brother-in-law, the wonderfully-named Barnabas Stenlake Shazell, lost his life and his ship, the Joseph and Thomas, two and a half miles north of Bideford Bar in a terrible storm. In 1936, my grandfather’s ship Ceres sank within three miles of Bideford Bar. The latter was not weather-related but one wonders whether a harbour of refuge at Clovelly, some 6 miles inside Hartland Point and 8 miles across the bay from the Bideford Bar, might have made a difference. I was gazing at the channel imagining vessels passing through, (while trying to hold my self and my camera still in the wind), when I noticed that there was someone else present whose perception of this stretch of water was obviously totally different from mine. 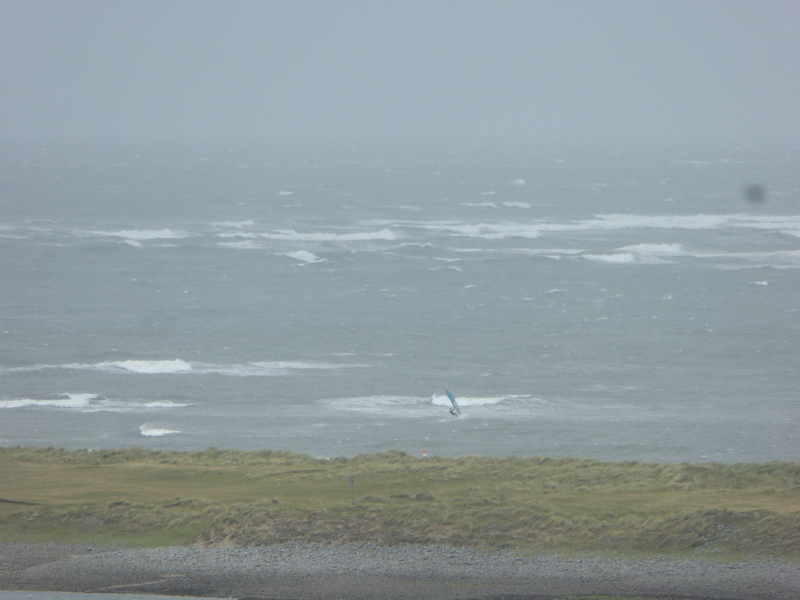 I wondered what the ghosts of sea-captains were making of the windsurfer! 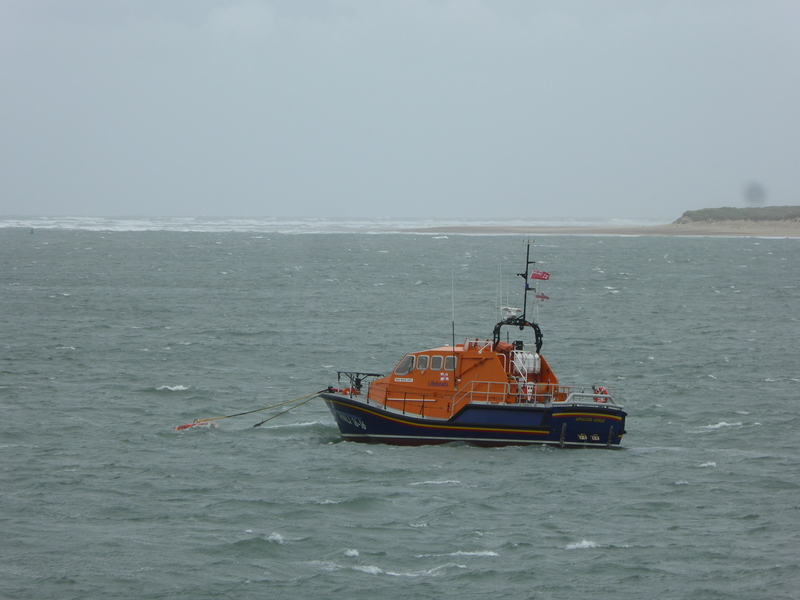 My guess is that those who know Bideford Bar best nowadays are the lifeboat crew. My other guess is that, like those before them, they continue to treat it with ‘a healthy respect’.